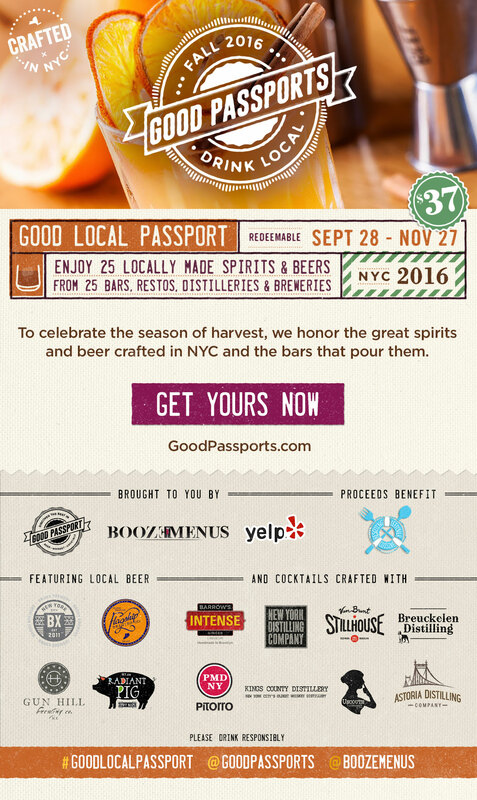 In celebration of the season of harvest, Good Passports, BoozeMenus and Yelp NYC have teamed up to present the Good Local Passport, which will raise funds for Rescuing Leftover Cuisine. They pick up leftover food from local bars & restaurants and deliver it to homeless shelters. By purchasing the Good Local Passport, you’ll get one cocktail, featuring one of the participating local distillers or a locally brewed craft beer at every location. Each participating location will offer you the choice of at least 1 of 2 locally made craft beer or cocktails featuring a spirit from one of the local distillers. Cocktails are based on 1.5 oz pours of liquor and beers are based on a 12 oz pour. Some of the sponsored spirits are meant to be poured neat and in those cases, you will be offered it as such. You can use the passport on any day, at any time from September 29th through November 27, 2016. When purchasing The Good Local Passport, choose the location where you would like to pick up your Passport. Passports are available for pick up from September 29 through October 29, 2016 at The Shanty and Butter & Scotch, and through November 5, 2016 at Handcraft Kitchen & Cocktails. You can pick up the Good Local Passport starting on September 28th if you buy a VIP Passport. A VIP Passport comes with a ticket to a free spirits & beer tasting party. Pick up your Passport at the location you chose any day from September 29 through October 29, 2016. VIP Passports can be picked up at the tasting party on September 28. Passports purchased at Handcraft Kitchen & Cocktails can be picked up any day through November 5, 2016. Bring your Passport to each of the participating locations any day from September 29 through November 27, 2016 and choose one craft beer or one cocktail from a participating brand at each location. Join us at our grand tasting kick-off event, where you can sample spirits from participating local distilleries as well as locally made craft beers. 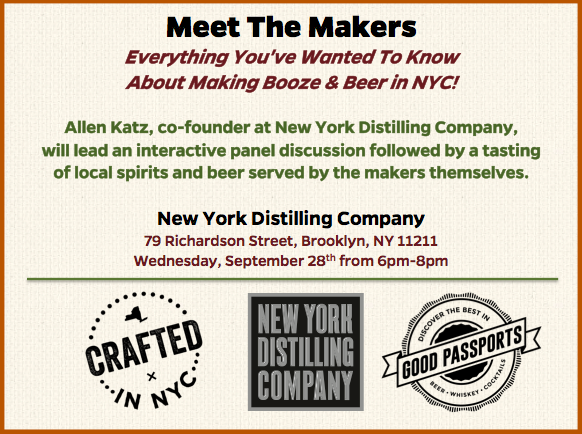 Sample from the participating distilleries & breweries + meet the maker! If you want to attend the tasting event, you must purchase one of the VIP tickets and pick up your Passport at New York Distilling Company during the party on September 28. VIP tickets come at no additional cost but there are only 100 VIP Passports available. Rescuing Leftover Cuisine is a non-profit organization dedicated to helping the hungry by donating leftover food from restaurants, hotels, universities and other businesses to homeless shelters. Rescuing Leftover Cuisine is a national 501(c)3 non-profit food rescue organization, operating in 12 cities and headquartered in New York City, that provides solutions to prevent excess wholesome cuisine from being wasted. RLC provides services such as food waste consulting, excess food delivery, co-branding services, and tax credit assistance. Do you have any Passports for the Dutchess/Orange/ Ulster county area?